We can sell over the phone and mail! Gift Certificates Available & we can sell over the phone !! Please Check out our Facebook page for daily updates and specials! Jan/Feb Hours are Saturday 10-5 and Sundays 10-4, or by Appt. 315-778-1191 Amanda Miller, WE SHIP! The Lake Ontario Gift shop is located on the Main St of Chaumont across from the Crescent Restaurant. We are located in a early 1900's historic gambrel style home taking up all of the first floor, over 1500SF of beautiful hardwood floors, oak wainscoting and old style charm! 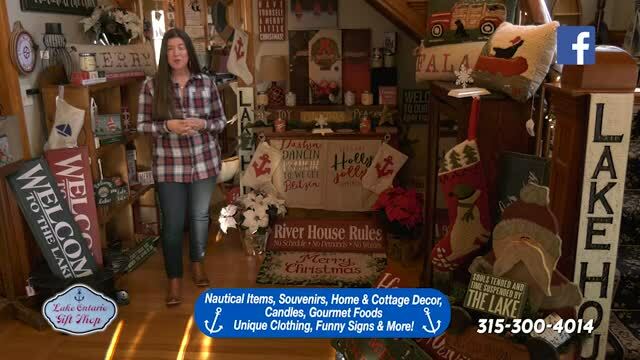 We feature Home, Cottage & Nautical décor, wine themed items, pottery, candles, T-shirts, hats, sweatshirts, signs, canvas bags, pillows, rugs, some smaller furniture items and so much more! Most of which is all made in the USA! TONS OF LAKE AND RIVER ITEMS! SOMETHING FOR EVERYONE! We hope to feature local food and gourmet items, artisans and artists, please contact us at [email protected] if you have something you think we might be able to sell, we love local! Please check out and like out Facebook page as we will post specials and coupon codes. We feature Great Bay Pottery!